No 103 Squadron was formed on 1 September 1917 at Beaulieu in Hampshire from a nucleus of No 16 Training Squadron. A week later they moved to Old Sarum in Wiltshire where they worked up and prepared for deployment to France. The Squadron was equipped initially with a variety of aircraft before finally receiving DH9 bombers in March 1918. On 12 May 1918 the Squadron moved to France under command of Major E N Fuller, arriving first at Marquise before moving to Serny to join 80 Wing, X Brigade RAF. The Squadrons role was reconnaissance and day bombing operations, principally the latter, much of it concentrated on railway targets. 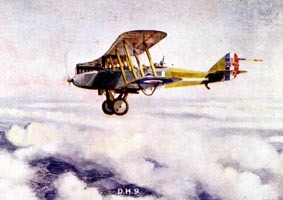 The DH9 aircraft was destined to be a failure compared to its predecessor the DH4, being underpowered and less reliable with consequent effects on squadron morale. In bombing operations the standard bomb load was two 112lb bombs with which the DH9 struggled to make an altitude of 14,000 ft. The DH9 had a forward firing Vickers gun and the Observer/gunner had a single or twin Lewis gun at the rear. Without a bomb load, the aircraft was quite manoeuvrable and capable of fighting off enemy fighters. Additional protection was afforded by flying in formation to give mutual support. Raids were carried out typically with formations of six to nine aircraft. For reconnaissance, single aircraft would be sent out with fighter escorts conducting their work at around 12,000 ft. 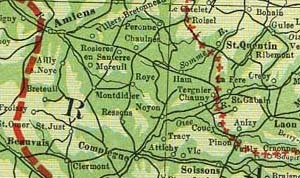 The Squadron arrived in France after the German Spring offensive on the Somme and the Lys, with the opposing sides still maintaining a balance, but with the Allies anticipating a further German attack. This was to come against the French front at the beginning of June with the Battle of Matz. Early raids were conducted 20 May on Seclin and on 22 May on Douai. At the beginning of June No 103 Sqn transferred to IX Brigade (effectively the RAF mobile force) and went to Fourneuil on the French front in the build up to the Battle of Matz. This followed a request from General Foch on 29 May for air reinforcements on the French front, anticipating a German offensive, IX Brigade deployed most of its squadrons plus 103 Sqn and the two Wing HQ's to the Beauvais area arriving on 3 June. IX Brigade came under the command of Commandant L Picard, air commander of the French group of reserve armies. The Squadrons first casualties were Capt. Turner & 2nd Lt. Webb who were killed in action on 5 June having been attacked by four EA(2) over Warsy-Liglieres; the Squadron had been bombing Roye, dropping 22 112 lb bombs. The following day 103 Sqn was conducting bombing missions on Roye (town) and La Fere (railway sidings). Capt Stubbs & 2nd Lt. Dance, 2nd Lt. Heebner & Lt. Eddy and Lt. Leiper & Lt. Henderson shared the Squadrons first claimed "victories" destroying a Fokker DVII and sending another OOC over Fretoy (SW of Ham). On 7 June the Squadron was conducting bombing and recce missions on railway targets at Ham and Nesle. IX Brigade diary noted large enemy formations of 27-40 aircraft attacking the bombing squadrons, a marked increase in defensive activity. 103 Sqn flew further bombing missions on 8 June to Nesle and Fresnoy-le-Roye; 49 Sqn also attacked these targets. Typically 10-18 112lb bombs were dropped on these targets. 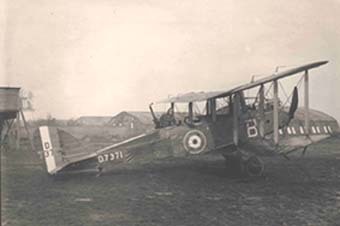 DH9 D7371 of 103 Squadron; this aircraft was flown by Lt.s Hett and Gardner on the 9 November raid on Enghien station and nearby airfields. Lt.s Wilson and Preece flew this aircraft the following day on its final flight of the war. The German offensive was launched on 9 June (the Battle of Matz) and there was intensive fighting over three days. 103 Sqn dropped 22 112lb bombs on Ognoelles hitting the town, aerodrome and a tunnel entrance. Lt.s Windridge & Allen MC were killed in action. On 10 June, the second day of the offensive, all Brigade squadrons were employed on bombing and low level attacks against troops, 48 112lb bombs were dropped and 12,090 rounds fired by 103 Sqn. The following day the Squadron dropped 34 112lb bombs and fired 10,400 rounds against troops, transport and artillery batteries. On 12 June fewer attacks were made because of poor weather; 2nd Lt.s McGee & Thompson were killed in action in the area of Montdidier. On 16 June a higher level of activity resumed with 103 Sqn dropping 10 25lb and 14 112lb bombs on Roye; Lt. Darroch & Lt. Tussaud claimed an EA driven down OOC; 2nd Lt.s Hirst & Hughes were killed in action over Crape-au-Mesnil; 2nd Lt. Mercer-Smith & Sgt. Anderson were both wounded and captured at Roye. Poor weather reduced flying operations until 18 June when the Squadron bombed Roye railway junction and Orvillers, dropping 16 25lb and 14 112lb bombs in two raids on the first and 8 25lb bombs on the second. (1) C S Hammond map, courtesy of the University of Texas Libraries, The University of Texas at Austin.